An African safari is arguably one of the most alluring and universally understood dreams of our time. Just the thought of an African safari evokes adventure, a journey through nature’s grandest spectacle, a glimpse of the earth before man. Peter and Beverly Pickford’s African Safari is an exploration of everything the word safari conjures up, from journeys on horseback or by dugout canoe to the quiet drifting of a hot air balloon, the tension of silent waiting on foot, to the smell of dung, soil and the rain. An intimate odyssey through the great wilderness of Africa, encompassing Kenya, Tanzania, Uganda, Rwanda, Zambia, Namibia, Zimbabwe, Botswana, and South Africa. 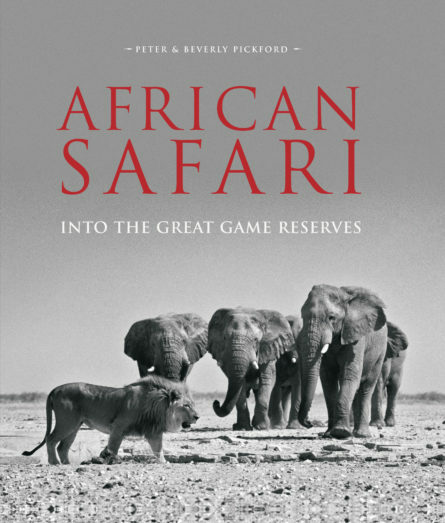 Peter and Beverly Pickford are among Africa’s most celebrated wildlife photographers and authors. Their work has consistently received critical acclaim, and has appeared regularly in prestigious magazines such as Africa Geographic. Their previous publications include Miracle Rivers and Forever Africa.